If you would like to tell your friends about me, you will have to use the PAST SIMPLE tense , which is used for past FINISHED actions . 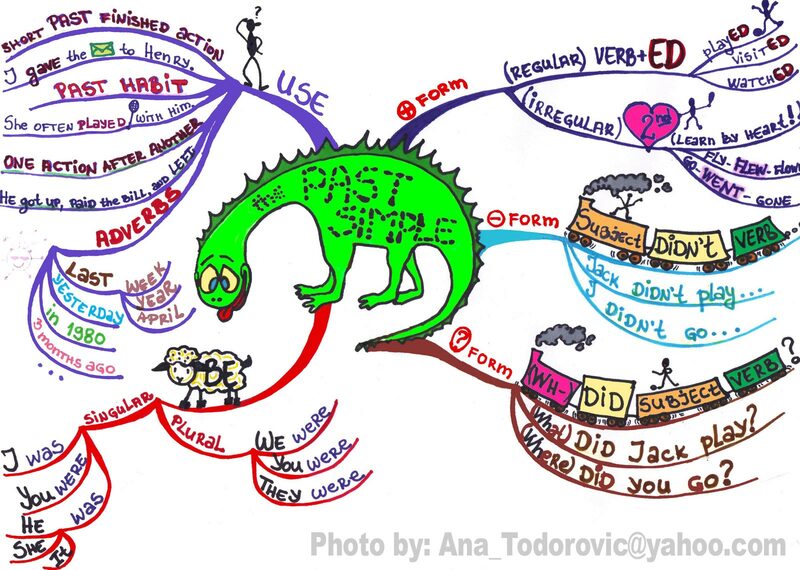 So, let’s start learning the past simple tense and look at the mind map! Firstly, take a look at the blue branch on the right which will explain the affirmative (positive) form of the Past Simple tense. As you can see, the branch is splitting into 2 smaller branches, thus introducing two different types of verbs in English: regular and irregular . As it is shown in the map, when the verb is regular , all you have to do is add –ED to the verb and that’s it! (For example, Mike play ed football yesterday. Linda visit ed her sister in New York last month. I watch ed that film 3 days ago. If the verb is irregular , you will have to learn it by heart! Memorize the second column of the irregular verbs! It’s illogical, but it’s unavoidable! You will find a list of irregular verbs in EVERY English book! For instance, the past tense of fly is flew (fly/ flew / flown) . For the time being we are only interested in the second column, because it’s the Past Simple Tense! But, since you will need the third column as well, to form other tenses in English, it is advisable to learn both the second and the third column of irregular verbs. BUT remember: you will only use the 2 nd column to express a past finished action! (Examples: Susan went to Florida on business. GO / WENT / GONE). Remember: the Past Simple Tense has the same form for every person, both singular and plural. Secondly, we will focus on the negative form, that is, the light blue branch. The train stands for the negative form sentence word order. So, the subject comes first, the negative auxiliary verb did not ( didn’t ) follows and then the main verb in the infinitive form. (For example: Jack didn’t play football yesterday. Or: I didn’t go to the cinema yesterday.) As you can notice, we do not need the 2 nd column any more. Neither do we need to add –ed. We only require the bare infinitive form (infinitive without to ). Thirdly, the question form of the Past Simple Tense can be analyzed looking at the brown branch. The locomotive, which comes first, stands for the wh- question word (what, where, how, which, when…). It is optional (in brackets) because a question need not begin with a question word. Now, the most important thing when the Past Simple questions are concerned is: we must use the auxiliary verb did when we make questions! (For example: Where did you go yesterday? Or: What did Jack play ? ).Bare this in mind! And finally, let’s see when we should use the Past Simple Tense and observe the violet branch. As we have already stated, it is used for short past finished actions ! (Example: Louis brought a photo out of his wallet and showed it to us. Or: Columbus reached America in 1492.) Then, we use the Past simple tense when we talk about a past habit. (Example: Before the accident, she played tennis twice a week.) In addition, the Past Simple Tense is used to list a series of completed actions in the past.